In Ethiopia, coffee beans are roasted during the ceremony. If you don’t have a roaster, purchase a bag of already roasted beans (Ethiopian ones, of course! ), and either grind them at home or purchase them ground. Ethiopians use a large clay pot, called a jebena, to mix hot water and the coffee grounds. You’ll want to find a container at home that is suitable for serving hot coffee. And if possible,use small serving cups. The person performing the coffee ceremony stirs the coffee into the jebena. Once mixed, strain the coffee through a filter (you can use cheesecloth) several times to separate the liquid from the grounds. Ethiopians traditionally take coffee with sugar and no milk. Holding the jebena a foot above the cups, , the host fills each cup with the fresh brew. The eldest ceremony participant is served first and the host’s family and friends are served after all guests have received a cup. 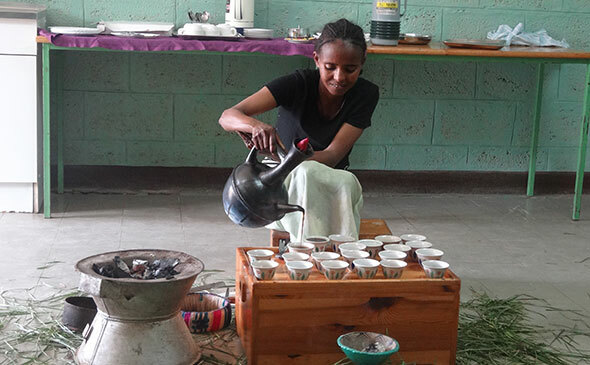 Ethiopian custom is that visitors stay for three cups of coffee during a ceremony, with the third cup being said to bestow a blessing on the host’s visitor. Coffee ceremonies normally take place three times a day, and are often filled with lively discussions on life, politics and the community. 6. Don’t forget the snacks! Offer small snacks – in Ethiopia,seasoned popcorn or peanuts are customary – to enjoy with the coffee and conversation.